I knew I probably couldn’t have a “posse” of seven people following me around behind the scenes so it worked out perfectly that GMA has the little studio audience tables where I could reserve spots for my friends to watch the show. So that just left my parents and me to arrive at 5:45 AM (when it was still dark out!!) where we rotated among my dressing room, the studio for review/practice, the hair and makeup room, and down to the kitchen basement (where their food stylist was hard at work) for more review/practice just before the segment started. I really spent a lot of time going through everything since I would be cooking a little on air – no pressure! 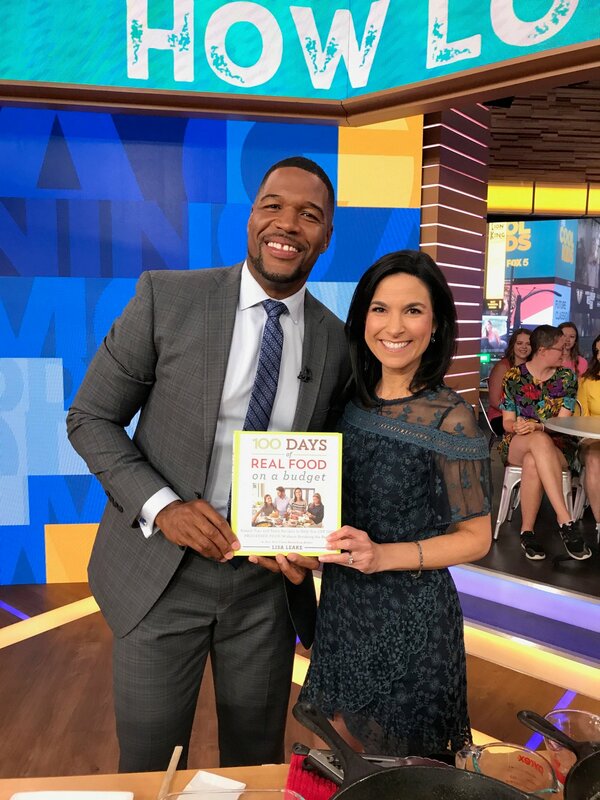 It was a busy morning, and I have to say it was very exciting to be walking back to my dressing room and casually passing Robin Roberts and Michael Strahan in the hallway. I tried to play it cool like I am not just a mom from NC normally sitting in carpool or working on my laptop in my comfy pants at home, LOL. It was definitely not your average Monday! Then, as we approached the end of the 8 o’clock hour, it was time for me to go on set for my segment with Michael. I tried so hard not to be too nervous! He was SO incredibly nice and easy to do the segment with. I honestly couldn’t believe how genuine and kind he was (because I am just one of the thousands to do this type of thing with him). He acted like I was going to be leading him through it, not the other way around. Haha – good one! But I sure did try my best and managed to just fly right through everything we were supposed to talk about (it went by so fast) without stumbling on my words or catching anything on fire. I took one big sigh of relief when it was over, but then – unbeknownst to me – all the hosts came on set and still wanted me there as they said goodbye and ended the show – bonus! As soon as we were done we were allowed to take pictures with all the hosts – Michael was sure to grab my book so I was holding it (this is what I’m saying, super nice), and they were happy to let my parents come up and join me for a photo. And my friends got plenty of selfies and other pics with the hosts in the audience as well. Pretty much, it’s going to be hard to top this trip when we go on our next Girls Weekend Away together! Also during the show, they gave away a copy of my new cookbook to every single person in the studio audience! So when we were all done my parents and I walked around outside to where the studio audience comes out (so we could meet up with my friends), and it was so funny to see every single person exiting holding my book. It only took a few minutes for someone to figure out I was the person who was just talking to them about the book so he came up to me and asked me to sign it. Then little by little everyone followed suit and we had a little impromptu book signing right there in Times Square (in the rain!) with my dad holding the umbrella for me. It was so unexpected and fun. I thought I would crash hard after all that excitement and such an early morning (with not much sleep coming to me the night before), but my friends and I somehow managed to paint the town red for the rest of our trip until we flew home the next day. My parents enjoyed being a part of the action, and all in all, it was a successful (and tiring) couple of days that I feel so fortunate to have experienced! It was a super special time that was made even better by getting to share it with family and friends. Say goodbye to questionable Chinese takeout with this one! In a shallow dish, combine the soy sauce and water. Add the chicken and marinate for at least 10 to 15 minutes at room temperature, or up to a few hours in the refrigerator. Place the flour on a plate. Remove the chicken from the marinade and roll the pieces around in the flour until all sides are coated. In a large skillet, melt the coconut oil over medium heat. Add the chicken and cook until golden brown all over and cooked through, 6 to 8 minutes. Move the chicken to a plate, leaving the flavorful bits in the pan. In the same pan over medium heat, cook the garlic, ginger, and pepper flakes for 30 to 60 seconds. Whisk in the vinegar, honey, soy sauce, and water and bring to a boil. Cook, scraping up the browned bits in the bottom of the pan, until the liquid begins to thicken, 2 to 3 minutes. Add the chicken, stir to coat it in the sauce, and serve warm. 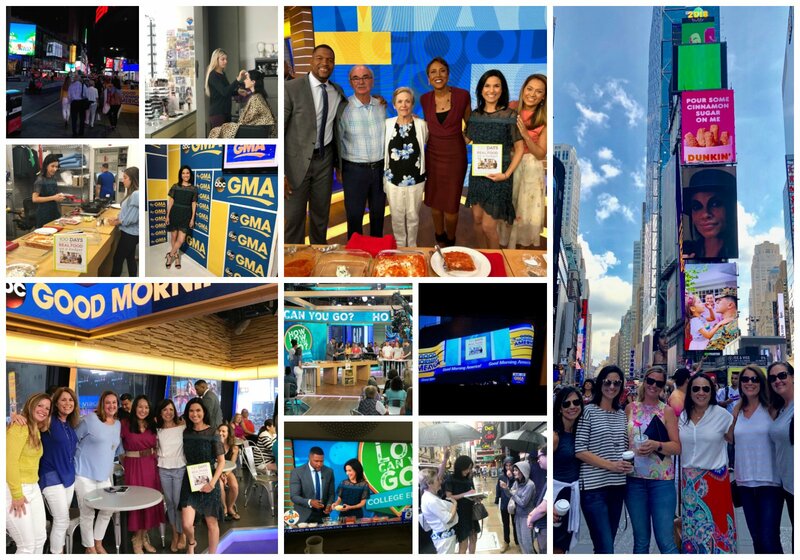 Lisa, thanks for sharing the behind-the-scenes info at GMA. How exciting for you. That was a once in a lifetime experience, well maybe not. How cool!!! Keep writing those cookbooks. You did great. I’ve been following you since you began your blog. Very proud of you. CAN YOU PLEASE SEND AGAIN THE trader joe’s products you approve of? Hi there. Here ya go: https://www.100daysofrealfood.com/what-i-buy-at-trader-joes/. 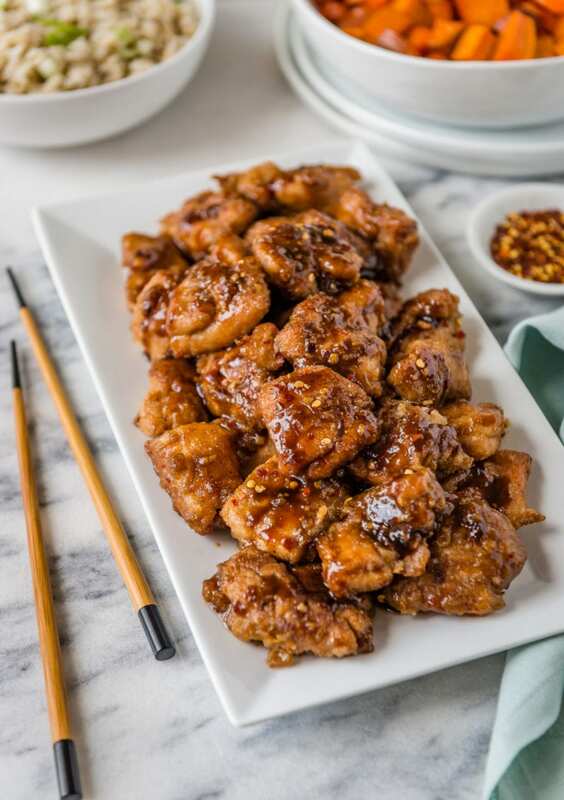 I made the Easy Chinese Chicken for dinner earlier this week, and it was fantastic! I’m eating the leftovers for lunch today, and I can’t wait to make it again soon. I love that I usually have all these ingredients on hand for a quick meal. Love all of your cookbooks! Just made this tonight with rice and broccoli and it was delicious!!! I did not have rice wine vinegar, so I substituted apple cider vinegar and it seemed to work fine. Thanks for another fabulous recipe!! I just made this and its really yummy! What can I substitute for coconut oil? My granddaughter is allergic to coconut. I made this last night along with the maple roasted sweet potatoes and carrots and stir fried broccoli from your cookbook. I did use chicken breasts as it was what I had on hand. It was all absolutely delicious! That sounds super exciting! It’s always nice to know the people we watch on TV are genuinely kind folks. Fun that your parents got to join in on the adventure! Can almond flour be substituted for the wheat flour? This is such a great recipe! So easy & full of flavour. My whole family loves it. I’ve made it several times now & have even been lazy & skipped the ‘flouring’ step. It still turns out delicious with a lovely thick sauce. This is such a good recipe! 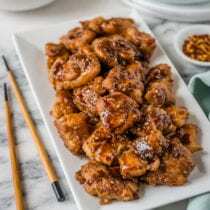 I have been trying to find a Chinese chicken recipe that turns out good and this one did! My only comment would be if you like sauce, make more of it. I could have used a little more but it was still very good!